Many athletes use interval running for increased performance. However, everyday exercisers utilize this training method to maximize calorie burn. The amount of calories burned during interval running depends on a variety of specific factors including age, weight and gender. Understanding how intervals affect calorie burn during and after exercise will enable you to determine your calorie expenditure. Interval running fuses short bursts of high-intensity exercise with brief recovery periods of low-intensity exercise. An example of an interval-running workout consists of an intense sprint for one minute immediately followed by walking for two minutes. The typical duration for interval running includes a five-minute warm up followed by a maximum of 10 to 12 intervals and concluding with a five-minute cool down. Resistance training exercises also provide a method for performing intervals. A sample resistance interval workout contains cycles of squats for 45 seconds followed by one minute of pushups then rest. The overall calorie expenditure during interval training varies in each individual due to a variety of factors. Influences like age, body weight and gender affect your calorie-burning potential. For example, older individuals burn less calories per activity compared to younger exercisers. People who weigh more expend a greater amount of calories as opposed to lighter individuals. Men have a higher calorie expenditure rate because of carrying more muscle mass than women. Lean muscle mass increases your body's metabolism. 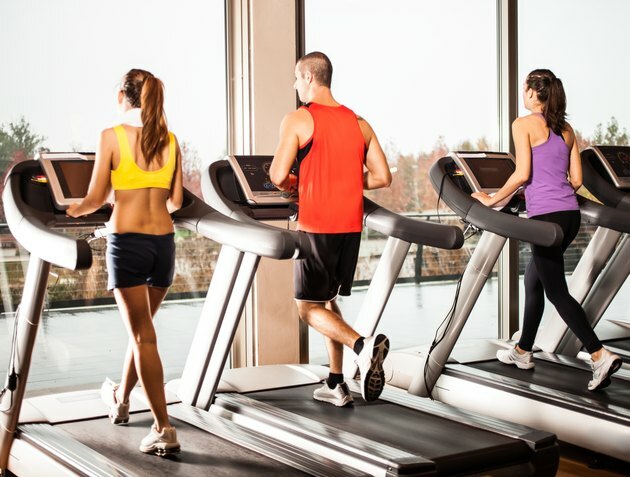 Due to the high intensity of interval running, the recommended workout time should last for 20 minutes or less. Taking this into consideration, a 180-lb. exerciser who performs sprint intervals at a speed of 12 mph for 20 minutes expends roughly 608 calories. To demonstrate how body weight affects calorie expenditure, a 250-lb. person burns approximately 845 calories using the identical sprint speed and workout duration. Your interval-running calorie burn continues to last long after you call it a day. Interval training stimulates a response in the body after exercise that increases your metabolism for up to 48 hours. Identified as excess post oxygen consumption or EPOC, this response causes the body to consume a greater amount of oxygen to return the body back to normal levels, resulting in increased calorie burn at rest.